I’ll bottom line it: this game is good. You should play it. Short, spoiler free review. I mostly write for Random Curiosity where I rant about anime, and sometimes I talk about a little something called ‘world building’. I’m sure it’s not an unfamiliar concept with fans of fantasy of all types; it’s about establishing the setting and the character’s role in it. This is what Legend of Heroes: Trails in the Sky, a fantasy role-playing games, does exceptionally well. It’s not just about an expansive world; Trails in the Sky is set in a single country (which has relationships with various neighbours). It’s also about how people live, the society they have built, and how the actions of the player affect the world. And Trails in the Sky has that in spades. I think it’s a prime example of the storytelling methods that only games can employ. 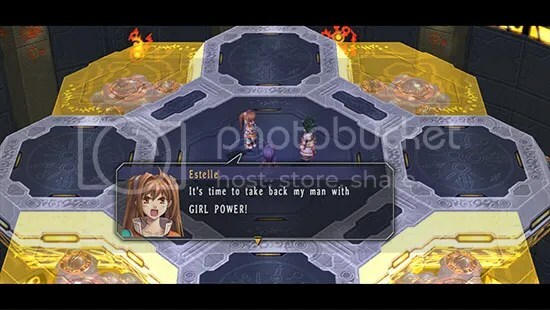 Almost every non-player character in Trails in the Sky have a name, have evolving views about current events, and some even have their own little stories that play themselves with or without your involvement. Too often games go out of their way to make the player the centre of the universe, but Trails in the Sky makes the player feel like they are part of their world, so when you’re out to save it you’re just doing your part. It’s hard to give the same kind of depth in other media; Lord of the Rings, for example, had incredible world building—Tolkien was a master—but a novel cannot put aside time for every side character and their worries about, say, sourcing ingredients for the local eatery they run. But a game like Trails in the Sky allows you to run around and explore, and see all these little textures of the world. The story takes after a similar method. It is solidly character-based, in that it is moved because characters set out to do so and others react to them—characters with lives, pasts, and motivations. The entire main cast are, while not incredibly ‘innovative’, are well fleshed. It’s a great way to tell stories, better at least than moving characters with arbitrary plot. Giving characters a sense of agency make their stories more compelling. And, of course, Trails in the Sky has all the good things you’d expect from a classic Japanese RPG, like airships, fighting monsters, and magical lightshows. It’s coherent, heartfelt, and generally satisfying all around. Trails in the Sky is so deep that it’s actually two whole games, telling its stories in two parts (cleverly titled the ‘First Chapter’ and ‘Second Chapter’). Start with the first one, of course. You can pick up a copy for the PC easy from both Good Old Games and steam. If you enjoy the classic JRPGs, like old Final Fantasy titles, I do recommend you do so. It’s one of the best polished examples you can get today. (One piece of advice: just play it on normal difficulty. Combat can get tedious on higher ones).